Four developers competing in the same genre sit down to have a friendly conversation. 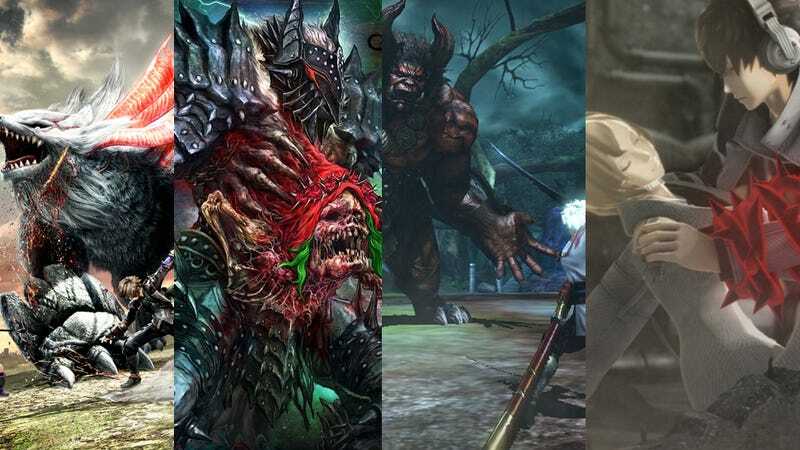 The multi-player large-boss-hunting genre is huge in Japan. It's hardly a stretch to say that the Monster Hunter series saved both the PSP and the 3DS in Japan. After the juggernaut that is Monster Hunter made its mark, every other Japanese game company has been hoping for a piece of the pie with their own hunting action game. In this week's Weekly Famitsu, 4 leads of 4 different hunting games got together to talk about each others' games. Hiroshi Yoshimura: Director of the God Eater series. Kentaro Motomura: Producer of the Soul Sacrifice series. Takashi Morinaka: Producer of the Toukiden series. Junichi Yoshizawa: Producer of the upcoming Freedom Wars. One of the major appeals of the God Eater series is the strong single-player story campaign and its anime-esque aesthetic that appeals to anime fans. "I still remember the promotional anime that was released before the first game." said Morinaka. Added Motomura, "There was a 3-year gap between the release of God Eater and God Eater 2. I was impressed that [Bandai Namco] was able to maintain fan interest with related goods for that interim period." One thing all developers seemed to agree on was the difficulty of balancing a single-player campaign with a multi-player mode. For the God Eater series, Yoshimura noted a change in the way gamers play such games which led to how the series was developed to match that change. "Recently I've gotten the impression that gamers will tend to play the multi-player after they've cleared the story mode." The product of Mighty No. 9 creator, Keiji Inafune, Soul Sacrifice was a game that caught the attention of many rivals. Said Yoshimura, "The sheer density of the completed game images was really impressive. We were in the middle of developing God Eater 2 and it was harrowing. We were asking ourselves if this level of quality was going to be the standard for the PS Vita platform." For Soul Sacrifics's story mode, the game uses a stylized storybook format to progress the plot. Said Yoshizawa, "That story-telling format was really fresh and new. I thought it was a good method to seamlessly draw the player into the game world." Motomura remarked, "By settling on this format, we were able to clearly express the world atmosphere, so I'm glad we did it. The development of Toukiden was closely involved with its fans, taking into account user feedback and changing the system to meet player expectations. For the developers at Tecmo Koei, the first playable demo was a bitter pill to swallow. Said Morinaka, "For us, we were going for a classic multi-player action game where you could feel the 'weight' of each blow, but many of the people who played the demo told us that 'it's too sluggish' and 'it moves too slow.' It made us realize that trying to adhere only to our envisioned goal didn't fit with modern sensibilities." After the initial stumble with the playable demo, Tecmo Koei quickly shifted gears and released a "demo update patch" – something that had never been done before. "When that happened, I thought, 'I didn't know you could do that with a demo!' it was shocking." said Yoshimura. Motomura added, "Considering the amount of work it must have taken and the schedule, I was constantly impressed." As the latest to the playing field, Freedom Wars has the advantage of being able to learn from the previously released games. Yoshizawa admitted to Yoshimura, "We studied God Eater to the fullest extent." While sharing the same genre, each game has managed to maintain a distinctiveness that makes them their own. Said Yoshimura, "If I were to give examples from everyone here, with God Eater, the ability to jump in a multi-player action game was revolutionary, with Soul Sacrifice, it was the removal of a stamina bar, and with Toukiden, it was the ability to destroy enemy parts multiple times. Simply by adding a single new idea, a game can change drastically, so I feel that the multi-player action genre will still evolve from here. For Freedom Wars, one of its key features is the "thorn" system. Looking at the system, Motomura remarked, "Such ideas come out of thinking and rethinking and talking them over. And when they evolve into a game-defining system, other supplementary ideas just come tumbling out." Yoshimura added, "Games are fun because they have rules, and it becomes bland when a feature simply makes things easier. It's about having a unique rule that is offered in a way that fits the game world. It's when it all fits together that you get a game that many players support." The multi-player action genre has become its own staple in gaming instead of just another action game. There's still a lot of room for the games to evolve and become even more engaging, and hopefully these men can continue to learn from each other to make their games more entertaining for us.